The candidates who have applied for the post of School Assistant, Secondary Grade Teacher, Language Pandit , School Assistant(Physical Education) and Physical Education Teacher in School Education Department are hereby informed that in recent recruitments it is observed that, the candidates are often committing mistakes in filling Bio data in their respective applications and requesting TSPSC for Bio data corrections in their respective PDF applications. But it is not feasible for TSPSC to make corrections in candidate’s respective applications, as it is the candidate’s responsibility to fill the application form correctly. Candidates are strictly informed that this Edit Option will be considered for one time only. Hence, the candidate should show utmost care while using Edit Option as this Data will be considered up to final selection. The candidates are directed to use this facility on.09th,10th and 11 th of January, 2018. 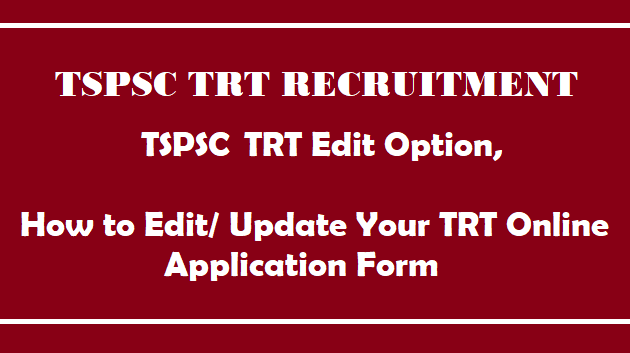 First TRT Candidate/Aspirant should have the Submitted TS TRT Application Form. In this form TSPSC ID, Date of Birth, Journal Number Details are availble. You can see the TSPSC ID in 2 Column, Date of Birth in 7 Column and Journal Numberin 25 Column. First Update your OTR(One Time Registration) with your TSPSC ID and Submit your Application. After complete this process. Step 2: In this TRT Post Name Section of Direct Recruitment Page, Click on the link of "District Edit as per 10 Districts". Step 3: A new "District Edit as per 10 Districts link" Page will be shown. Step 3: Then, you can recieve the OTP to your mobile number and enter the OTP and click on the "submit" button. The details as available in OTR database as on 28/11/2017 10:17:20 AM Date & Time are used in this application form. Step 5: Enter the Verification Code as displayed in the image and Click on sumbit button. Note: Once You Submitted Your Education Details , You Cannot Edit Education Details again. 7. Selection List: 10th May 2018. The last date for submission of online applications is extended up to 07/01/2018. The “Edit Option” for Make correction in TRT Online application will be available from 07/01/2018 to 11/01/2018 on the website.